I am indebted to my bridal couples shown below. Each of them has graciously given me permission to share their personal photos, and memories of their wedding dance, with visitors to my website. I cannot thank them enough for their generosity and support. Also, we have attended other functions post-honeymoon and it's nice to be able to get up and dance a waltz properly - so thank you again. I have attached a few photos from our professional photographer, Sugarlove Weddings, of Chad and I doing our bridal waltz. Thanks again Susan. It was a very enjoyable process working with you, and definitely a fun part of the wedding planning process. Thanks for everything over the past few weeks. Just wanted to let you know it all went perfectly on Saturday night - everyone was really impressed with our dance. Thank you so much for everything! We recently got back from our honeymoon and wanted to email you to let you know how it went. The dance went really well, and Tim's friends were surprised that he could dance so well. Thank you again for all your help. It was so lovely to meet you and learn some of the basics of ballroom dance. We really enjoyed the lessons." We just wanted to send you a quick email to thank you so much for your help and guidance again with choreographing and teaching us what turned out to be an amazing dance on the night!! Luckily neither of us suffered brain freeze so we were able to pull it off successfully (phew!!). We had a truly wonderful day, filled with great moments and fun. The dance went well... according to all of the guests. The nerves took over and instead of our exact routine we (more so Steve) needed to improvise a fair bit. Luckily that did not show (too much) and everyone thought it was wonderful. We enjoyed the dance and would like to thank you again for teaching us, since your guidance was essential in us not making a fool out of ourselves. We very much enjoyed working together with you and admire you for your patience, since we were not the most loyal practisers (as the actual execution showed). 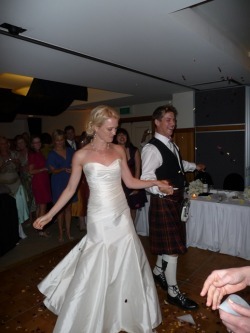 We certainly did have a lot of fun during the lessons, and enjoyed “showing off” our “skills’ on our special day. It's been well over a month since our wedding and wedding dance, we thought it was about time we send you a thank you email for teaching us wonderful steps. Every time I hear the words New York, I think of your dance routine and lessons! I loved those New Yorkers! It was a great experience and one we both really enjoyed. We had the most amazing day, full of love and laughter. Thankfully the laughter did not happen while we were dancing... We were a little ahead of the beat but were saved by my brother and Brendan's best friend who decided to give us a run for our money on the dance floor. It gave us enough time for us to get back on beat and finish our dance! Thank you again for your patience in teaching us how to dance. We loved it! Guy and I came back from our honeymoon a couple of days ago. We had an amazing time. Our wedding was spectacular and I can definitely say that it was the best day of my entire life. It was such a pleasure to meet you. Thank you for teaching us our first dance. We did a pretty good job according to our friends and family. 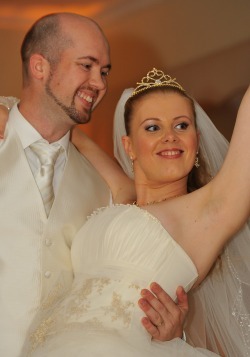 I have attached a couple of pictures from our wedding – I hope you enjoy. Thanks again for your support! We had so much fun learning to dance. Thanks! First of all, we wanted to say a BIG THANK YOU to you for helping us with our wedding dance choreography. We would not have coped with all of this without you!!!! The dance went fantastically, and everyone was shocked. So HUGE, HUGE, HUGE “thank you” for helping to make our day a romantic one . Don't know what we would have done without you." 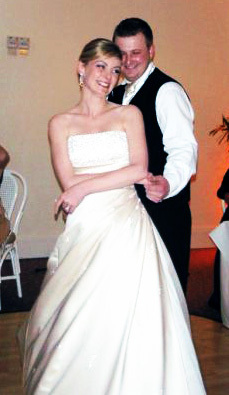 The wedding was a success, lots of fun, and we received so many compliments about our dance! A lot of our friends were very surprised at how well we danced, (especially Jon hehe :) Thank you again for all your hard work! 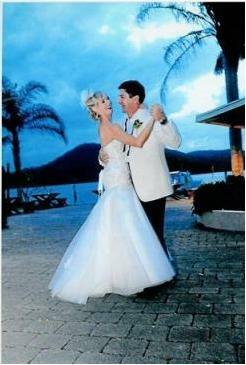 "Alessandro and I had the pleasure of being taught by Susan in 2009 for our wedding. Susan choreographed a fantastic routine to our chosen song ("You Are" by Lionel Ritchie) that was fun, and suited our different levels of dance experience. I can not recommend Susan highly enough; her endless patience, coupled with a winning personality, turned learning our first dance as a wedded couple from a nightmare to a joy! 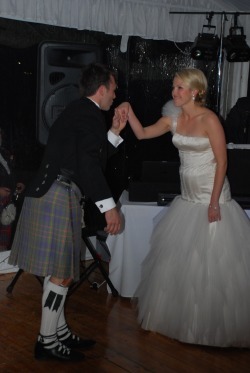 Our guests were surprised and quite amazed at what we managed to pull off on the dance floor. 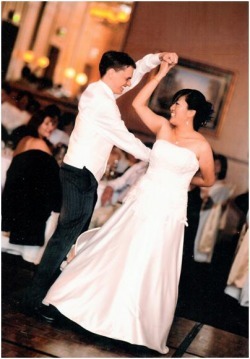 Our first dance remains one of the highlights of our wedding day, and I would recommend that all couples preparing to get married include dance lessons with Susan!" talking to each other during the dance! We have included some photos for you. 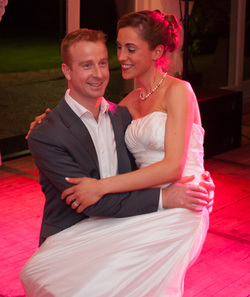 Thank you so much for the lovely routine you choreographed for us and for helping to make our wedding extra special." Just a short note to say thank you so much for all your assistance in choreographing & teaching us our wonderful rumba bridal dance. You are an amazing teacher – we were a hit on the day! We just wanted to say thanks again for all your help with our wedding dance. Once we started all the nerves went away and we had a lot of fun on the night. It was certainly a hit, as everyone at the reception was very impressed and there was lots of applause at the end. We could not have asked for a better day”. I have been meaning to email you to let you know that our dance was amazing and we remembered everything!!!!!! Everyone was extremely impressed and it did make the night that we managed to do it perfectly. Thank you for all of your hard work with us and when we get the video we will send you a copy of the dance so you can see. Thanks again and hopefully we will come back for some dancing lessons soon”. 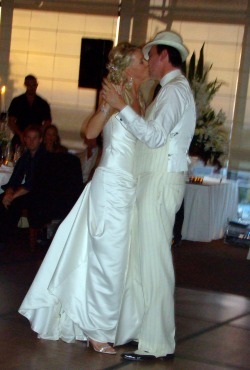 We wanted to thank you so much for choreographing and teaching us our wedding dance. We so appreciated your willingness to listen to our ideas and then make them work, despite our tight schedule and lack of dancing experience! We had so much fun on the day, and could not have done it without you. Thanks for your encouragement and tips - we remembered to take small steps! We just wanted to email you to let you know we did both you and ourselves proud. As soon as we get some pics we will send them through. 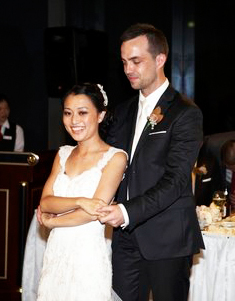 You taught my now husband, Johnny, and I the rumba for our wedding dance. We had such fun learning with you and still dance our routine together. 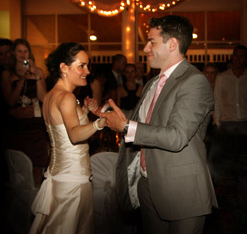 Our dance went so smoothly at our wedding. Thank you so much for everything that you taught us! I think we'll be contacting you again in the years to come to learn a new dance. We honestly just had such a ball having lessons. Thank you so much for making it such a wonderful experience!" Thank you so much for choreographing such an amazing routine for our first dance. It was so much fun working with you. Mark and I felt so comfortable with you. Love you so much." We just wanted to say (a very, very delayed!) Thank you for teaching us how to dance for our wedding last November. It all went well and everyone was most impressed! Please find enclosed a photo - we look like we are having fun!! We really enjoyed learning and performing our dance, and appreciate your patience as Hui Yee learned how to spot! All the best for wherever your dancing takes you! 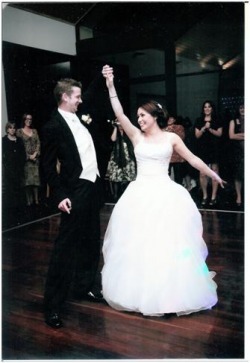 Thank you so much for recently teaching us our wedding dance to “Let there be love” by Nat King Cole .Our wedding day was on the 29th of March in the Hunter Valley, and we managed to perform our dance perfectly.Our guests really appreciated all the effort that we put into our dance. Having our lessons with you was one of the most enjoyable aspects of preparing for our wedding. We really surprised ourselves with pulling the dance off. Many thanks for all of your help!" David and I would like to thank you greatly for helping us with our wedding dance. We received so many compliments on the night – and it is all thanks to you. Thank you for giving us the confidence to carry out our dance in front of our guests.